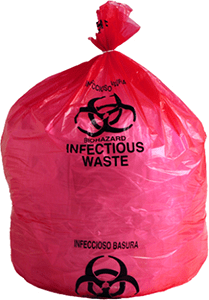 GPS manufactures custom made medical waste bags, biohazard bags and infectious waste bags. Our healthcare specialty hazardous waste liner plastic container bags are suited for any application in any medical or medical related field. We offer an assortment from soiled linen can liners or hamper bags, to our extra heavy duty 3 mil Infectious waste bags. To streamline waste management, a healthcare facility may choose to have human wastes be disposed in yellow-colored plastic bags; pathological wastes in either red, blue, or white bags; and general in black-colored plastic bags. Our high-visibility Medical Waste Bags are marked with the international biohazard symbol, or you can choose to custom print your own for you specific requirements. 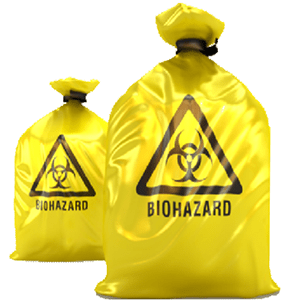 Why buy your biohazard bags and medical waste bags from GPS? Our infectious waste bags alert others of the biohazardous waste contained within and ensures correct handling. The standards and practices of disposing of biohazardous waste and biohazard bags are also mandated by state legislation and even smaller, local governments. If the established standards and regulations of these organizations are not kept in compliance by you or your organization, you face the risk of paying enormous fines and penalties, or worse. Simply stated, there’s no excuse not to have a ready supply of biohazard bags to properly dispose of biohazardous and medical waste. It’s important to note that there are biological materials you may not consider to be biohazardous, when in fact they are. Biohazard bags must be disposable but biohazard bags must also be impervious to moisture and have a high tear and puncture resistance. It is critical to our business, community and the environment to dispose of such waste properly. At GPS we can custom produce a wide variety of biohazard bags in a variety of sizes to accommodate your business needs.